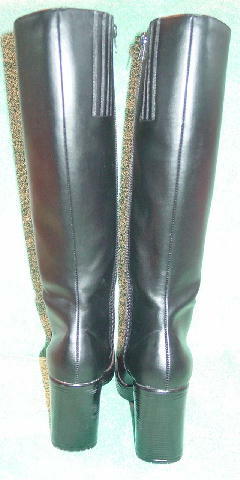 These black all manmade materials boots are by ellemenno. They have an inner 15" long zipper. To the back of the zipper is a 1 3/8" wide by 3 1/2" long elasticized panel which expands to 1 7/8" wide. They have faux stacked heels and nonskid soles. The heels have scuff marks. They're from a stylist's inventory, and were worn once, for a photo shoot. 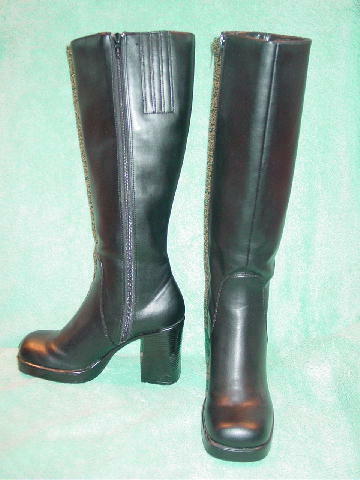 bottom of heel to top of boot 17 7/8"